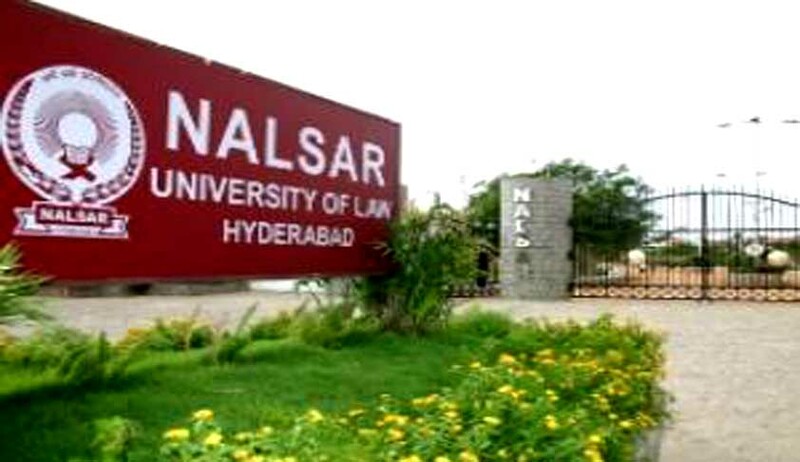 NALSAR University of Law, Hyderabad has invited applications from the eligible candidates for the posts of Professor (Law), Associate Professor (Law), Associate Professor (Management) , Assistant Professor (Management)and Assistant Professor (Law, History, Economics, Political Science & English). Salary: Salary is negotiable and will not be a constraint for qualified and well experienced candidates. Payment can be made either in UGC scales or on consolidated pay. An eminent scholar with Ph.D. qualification(s) in the concerned/allied/ relevant discipline and published work of high quality, actively engaged in research with evidence of published work with a minimum of 10 publications as books and/or research/policy papers. A minimum of ten years of teaching experience in university/college, and / or experience in research at the University/ National level institutions / industries, including experience of guiding candidates for research at doctoral level. An outstanding professional, with established reputation in the relevant field, who has made significant contributions to the knowledge in the concerned/ allied/ relevant discipline, to be substantiated by credentials. A Master’s Degree with atleast 55% marks (or an equivalent grade in a point scale wherever grading system is followed). A minimum of eight years of experience of teaching and/or research in an academic/research position equivalent to that of Assistant Professor in a University, College or Accredited Research institution/ industry excluding the period of Ph.D. research with evidence of published work and a minimum of 5 publications as books and/or research/policy papers. A minimum score as stipulated in the Academic Performance Indicator (API) based Performance based Appraisal System (PBAS), set out in the Regulation in Appendix III of the UGC Regulations on Minimum Qualifications for Appointment of Teachers dated September 18, 2010. Ph.D degree or a fellowship of IIMs, ICA or ICWA or other institutions recognized by AICTE, with First Class Masters degree in Business Management/ Administration/ other relevant management relevant disciplines/ PGDBM/ PGDM programmes. Minimum 5 years experience in Teaching/ Industry/ Research Profession or at least 2 years post PhD is desirable. Besides fulfilling the above qualifications, the candidate must have cleared national Eligibility Test (NET) conducted by the UGC, CSIR or similar test accredited by the UGC like SLET/SET. Notwithstanding anything contained in sub-clauses (1) and (2) to this Clause, candidates, who are, or have been awarded a Ph.D. Degree in accordance with the University Grants Commission (Minimum Standards and Procedure for Award of Ph.D. Degree) Regulations, 2009, shall be exempted from the requirement of the minimum eligibility condition of NET/SLET/SET for recruitment and appointment of Assistant Professor or equivalent positions. NOTE: Candidates with Degrees from IIMs / IITs / National Law Universities or reputed foreign institutions who have teaching experience of IIMs / IITs / National Law Universities would be preferred. Application Fee: An application fee of Rs. 1,000/- shall be paid by way of demand draft drawn in favour of ‘Registrar, NALSAR University of Law’ payable at Hyderabad and should be attached alongwith the application form. Application fee will not be refundable. How to Apply: Candidates should apply in the prescribed application form which can be downloaded from the University website www.nalsar.ac.in along with detailed bio-data and application fee and the same should be sent to the ‘Registrar, NALSAR University of Law, Justice City, Shameerpet, R.R. Dist. 500 101 Telangana’.